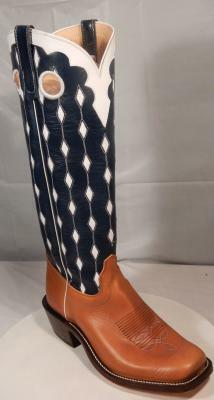 16" Olathe elite tan orly vamp 4D heel, cutter toe leather sole navy 16" top with diamond inlays and collar make this boot a real eye catcher. special run of E width only won't last long let us know if you want a pair today. 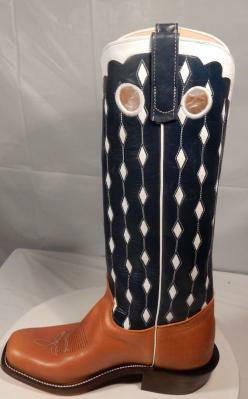 All Boots carry factory warranty on Materials and workmanship by Rios of Mercedes, Olathe Boot, or Andrson Bean Boot Co.
Cbyboots wants to extend full return privileges on all products if they have not been worn or damaged unless otherwise stated.